In a joint press conference during the GoGlobal mission by Startups.be, deputy prime minister Alexander De Croo together with Filip Lammens, CEO of VIA Don Bosco and Roderik van der Veer, co-founder and CTO of SettleMint, announced a project to use blockchain technology to alleviate administrative overhead in the NGO financial management process and allow more time for the core mission, providing education across the globe. VIA Don Bosco, SettleMint, and Howest created a unique partnership to increase the impact of development cooperation in African educational projects. They sat together at the initiative of the Belgian D4D-Be platform. VIA Don Bosco invests around 9 million euros in education and employment in Africa and Latin-America every year. About half their funding comes from the Belgian government and the other half are donations from individuals, companies or foundations. “VIA Don Bosco wants to use these funds as effective and efficiently as possible, to fully optimize the impact.” says Filip Lammens, CEO of VIA Don Bosco. That’s why VIA Don Bosco has decided to partner up with Belgian blockchain technology company SettleMint and the Howest research lab, to safeguard the allocated funds and donations of their community. Historically, one of the greatest challenges of any NGO has always been to monitor and report about the spending of these substantial amounts of money. It's mandatory for NGOs working in poor and fragile states to counter wrongful use of funds. The management of VIA Don Bosco has already invested a lot of effort to make sure funding is used properly. From the careful selection of trustworthy partners, to writing elaborate internal and external financial monitoring processes: VIA Don Bosco is committed to using every last cent for the purpose it was gifted to their organisation. These processes however are extremely time consuming and take around 40% of the time of their staff in Brussels and often even more from their international partners. Process analysis also shows that too much of this time is spent on purely administrative tasks and not enough on actual financial management. Furthermore, despite all checks and balances, the system is still vulnerable for those who have malicious intentions. VIA Don Bosco believes that this scale can be tipped and that recently developed technologies such as blockchain technology can help them not only optimise their financial processes, but also significantly decrease or even eliminate fraudulent use of funds. By taking advantage of the shared database capabilities of blockchain technology among the organisations managed by VIA Don Bosco and the parties involved in the monitoring of their activities, all data is verified and validated at the input and is accessible in near real-time. It reduces the usual six months required for reconciliation, verification, and validation of the financial information for each school and office in each country, to mere seconds. The immutability of data offered by a blockchain-based monitoring system provides a tamper-proof and fraud-resistant ledger of historical data for every allocation of VIA Don Bosco’s funds. Even more, as the verification happens directly in the field by the involved organisations and individuals, administrative overhead across the board is significantly reduced. The use of blockchain comes with new technological and organisational challenges. Therefore the experience SettleMint brings to bear in putting these technologies in production, combined with a track record in applying these technologies in the financial and humanitarian sector globally, is invaluable to ensure successful adoption of this new and improved system. “Using our distributed middleware solution, we allow organisations like VIA Don Bosco to leverage the benefits of Blockchain with confidence and be ahead of the curve in applying technology to optimise the execution of their mission” says Roderik van der Veer, co-founder and CTO of SettleMint. 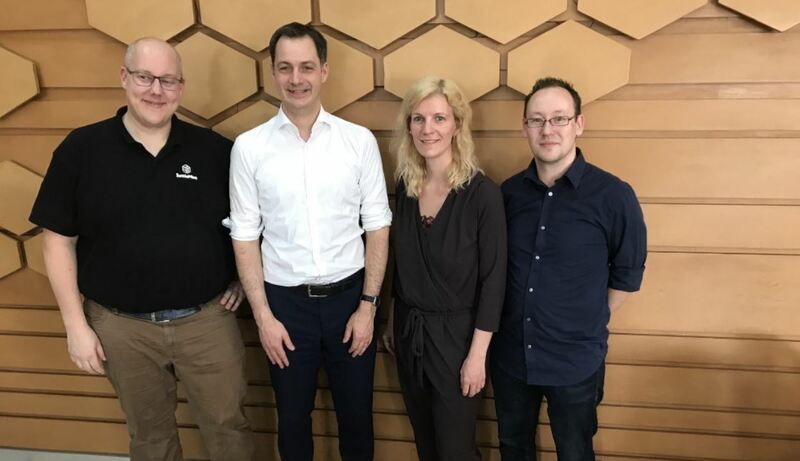 The Howest research lab ‘Security & Privacy’ hosts experts in blockchain, cybersecurity, app development and web platforms. By combining their experience and by collaborating with in-house developers our team can deliver state-of-the-art proof of concepts. Their lean user-centered approach allows for various business ideas to be tested in a short time-frame. The technology stack is aligned with this approach. Backends are developed using a current leading technology, Laravel. This offers a flexible approach to interface with many existing API’s. Front-end modern web technologies are used to build responsive user interfaces. VIA Don Bosco is a Belgian non-governmental organization that supports educational institutions and employment initiatives for young people in Africa and Latin America. Its aim is to contribute to the realization of the rights for education of disadvantaged young people and marginalized communities both in the North and in the South. SettleMint is a Belgian based Blockchain technology company (with an office in Dubai), and was incorporated by Matthew Van Niekerk & Roderik van der Veer. SettleMint helps organizations leverage the benefits of blockchain technology: whether those enterprises are looking to improve efficiency, to extend their current products or to completely reinvent an existing business model by offering them our distributed middleware Mint. Mint makes it easy to build the Blockchain business solution(s) you’re looking for. So in short, it doesn’t matter if you are a startup or a big corporation, if you think Blockchain technology can be part of your business or your vision for the future, you, or the developers working in your organization, can start building Blockchain based applications in no time using Mint. First of its kind Belgian Digital for Development platform, initiated by the Belgian Development cooperation (DGD), launched in September 2017, and coordinated by Agoria and Close the Gap. Its focus is to bring actors of development together by creating and facilitating an eco-system for all stakeholders, existing projects and opportunities using digital in development. Ultimate goal is to build a bridge between the Belgian private sector and the development sector in realizing the Sustainable Development Goals and create new partnerships.